The first decade of the 21st century saw the emergence of the importance of protecting our environment. Being part of the school system at the time meant watching as curriculums changed and seeing notices over light switches to remind the teachers about the new measures in place. I remember when recycling became more than just a phenomenon, it became a way of life. I recall wondering which bin my bottle went in to, until finally it all became second nature. For my generation, climate change is something that has been a part of our lives as we grew up. Everyone knows that climate change is not something to joke about. Why is it then, that in approaches to climate change, it is always the economic impact that is considered first? Our finite resources such as oil are under risk and will run out relatively soon, yet we continue to burn through our resources at an alarming rate. Our sea-levels are rising, our species are dying out and we have reduced freshwater availability. These are only the beginning of the long list of climate change effects. Yet we constantly need a reason to make change. When considering making changes to our lifestyle to benefit the environment, the incentives are always economical – how much money will we save? News outlets and politicians use buzz words like “environmentally friendly” or “climate change aware” but they have been thrown around for so long that they have lost all impact or meaning. No one seems to comprehend the extremities we are facing if our current pace of life does not change. As a geography student myself, I am aware that the impact our current way of life has on the environment around us is vast. However, I was unaware of the EXTENT to which our resources are running out. Consumerism has engulfed the developed world and millions of jobs are focused on selling the consumer products and convincing them that they always need more. Marketing campaigns that depict happiness upon purchase of a certain product place pressure on consumers to consistently be purchasing their new product, or they will not achieve this generated form of contentment. Technological advances, though beneficial in many respects, feed into this consumerist lifestyle; the consistent desire to have the latest gadget. Our daily lives are consumerist driven, even on a college basis. Walking around with coffee cup in hand is no longer a source of refreshment, but a fashion necessity. The pressure to have a smartphone is outstanding, while a new laptop every year is a must. Wearing the same outfit twice in one week is unprecedented and accessories are expected to change all the time. 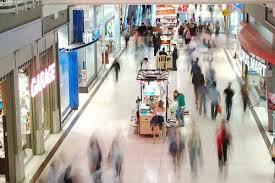 A busy shopping mall, another example of our consumerist society. Why is leading a sustainable lifestyle not fashionable? As a global community, we need to generalise the idea of living a life where your demands on the planet are at a reasonable rate. The phenomenon of doing more with less is not scientifically startling, but it is challenging. I am of the belief that by a combined volume of small efforts, climate change can be tackled head on. Everyone knows that you shouldn’t leave the tap on when you’re brushing your teeth and that lights should be switched off upon exiting a room, but these were the things introduced when this climate change phenomenon started more than a decade ago. Surely we have made more advancement since then? The next decade will be challenging for economists and environmentalists alike. While economists attempt to predict the financial future of the developed world, environmentalists will be trying to predict how much longer we have on the planet before something has to give. The experts in both fields need to take each other’s concerns on board, and recognise the validity of the alternative area of expertise. By combining the knowledge of two fields of people, a more feasible way of dealing with our every changing climate can be devised. Hopefully this will come into place before it is too late.